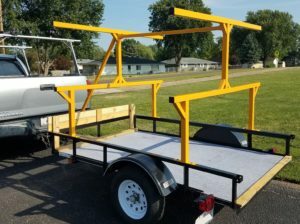 I recently finished my kayak trailer, just in time for a campout. I’ve included plans in case you’d like to build one like it. Take a look at the project page. Even though I’ve added some content, I haven’t actually “posted” to this site since 2011. In the past I created a static “page” for anything interesting I put here, then a simple “post” to draw attention to it. A “post” has a date associated, and is the basis for a “blog”, which this site really isn’t anymore. Anyway, since I’ve been adding stuff, I might as well create a post to lead you to it. Cub scout pinewood derby time is upon us again, so I’ve put up some information about the cars my kids and I have made. Take a look at the project page! One thing Geocaching.com doesn’t make easy is finding the location of archived caches. I grabbed my whole history of pocket query files (back to April 2004) and built a GPX file containing all archive caches I could get my hands on. The map below shows up to 50 miles from Peoria, but my data is most complete within 30 miles of Peoria. We recently bought a couple of recreational kayaks, and needed a way to store them. 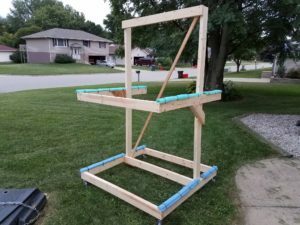 In order to safely and economically store them, I built some racks. Take a look at the project page for more details. I haven’t posted anything in quite a while, but at least I’ve got something done. Mia’s bed is finished! Ok, this is something that very few of you will be interested in, but I wrote a web application to help in placing geocaches. 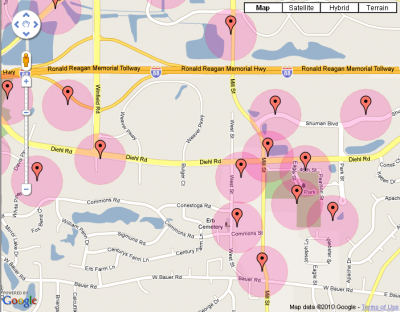 Geocaches can’t be placed to close to one another, so this tool can help you find which spots are off-limits. Take a look if you’re interested. Earlier this year I got an Android phone (the Droid Incredible), a purchase I’m quite happy with. One thing I really like about the Android platform is it’s open nature. I know that’s become a trite sentiment, but compared to my iPod Touch, there are very few limits on my ability to tinker with the phone. Now that I’m fairly comfortable with the phone and the O/S, tinkering is exactly what has been on my mind! An application I recently discovered is Tasker. It’s an amazing application that can be used for automating and customizing many of the features of an Android device. In short, you set up rules (called “contexts”) that, when triggered, cause different actions to occur. At home, school, work, and church, set the ringer volume appropriately. Turn on wi-fi only when I’m at home. Announce the time every half-hour (when I’ve got the headphones plugged in). When I receive a phone call or email, speak the name of the caller/sender. When my geocaching app is running, don’t let the display time out and shut off. When I plug in my headphones, launch the podcast app. A couple of minutes after I connect to my home network, update and download my RSS feeds and podcasts. If I’m someplace where the ringer needs to be off, ignore the volume buttons and keep quiet. If I can’t find my phone, I can send a special text message to it to cause it to ring as loudly as possible. If I think my phone is stolen, I can send a different text message to it. The phone will then find its location using GPS and reply with a message telling where it’s located, how fast it’s moving and how much battery life is remaining. I can also have it take a picture or record audio. Initially, I was going to post my scripts here, but I realized there’s not realy any further contribution I can make, other than just casting my vote for this app. The Tasker Wiki has a good set of example profiles that you can use to create your own, and it covers most common topics fairly well. 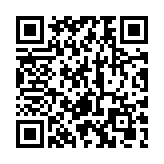 Tasker is available in the Android Market using the QR code above. It’s only a few bucks, and in my opinion it’s money well spent. Tasker might be a little daunting at first, but once you get past the steep part of the learning curve, there’s a lot of functionality!